Over the past couple of years, AMD has slowly released their mainstream brand of Kaveri processors. In turn, we have reviewed them, and they consistently aim to provide a midrange integrated gaming option, especially for those on a budget. The recent release of the A8-7670K was perhaps not that exciting, as AMD is filling up their product stack with new parts, taking advantage of an improved manufacturing process and aggressive binning. To that end, we're taking a different tack with this review. Alongside the regular tests, we also corralled Rocket League (an amazingly simple yet popular take on car football/soccer that sits on the precipice of e-sports glory) into a benchmark aimed at those sub-$600 gaming systems. Earlier this year, AMD announced their new line of Kaveri Refresh processors, starting with the A10-7870K (which we reviewed here). As the name suggests, these are Kaveri processors at their core, still based on the combination of Steamroller processor cores and 2nd generation Graphics Core Next (GCN) microarchitecture for graphics. These new refresh models are designed to take advantage of minor improvements in manufacturing, resulting in the ability to get higher clock speed for the same power consumption, even 18 months after the first Kaveri processors hit the scene. 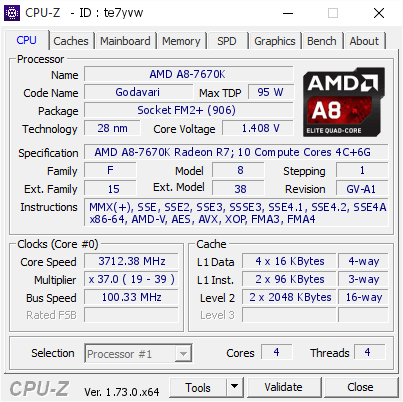 As a result, these Refresh processors — or, to use AMD's internal code name, "Godavari" — fill in the blank spots in the product stack and supersede the older parts, with the aim of squeezing in more frequency and performance for the same power consumption. It sounds deceptively simple — improve your process, refresh the part at the same price, and reap the benefits. If we look at AMD's current lineup, we see that this new A8-7670K surpasses the older A10-7700K on the specification sheet, and comes in cheaper when brand-new. As it stands, the A8-7670K is a dual-module 3.6 GHz base frequency processor with a boost frequency up to 3.9 GHz. It comes with six graphics compute units, which translates to 384 streaming processors, similar to other A8 parts, but at a slightly higher IGP frequency of 754 MHz. The combined increase in processor and integrated graphics frequencies come at no extra cost in thermal design, with the A8-7670K at the same 95W TDP. 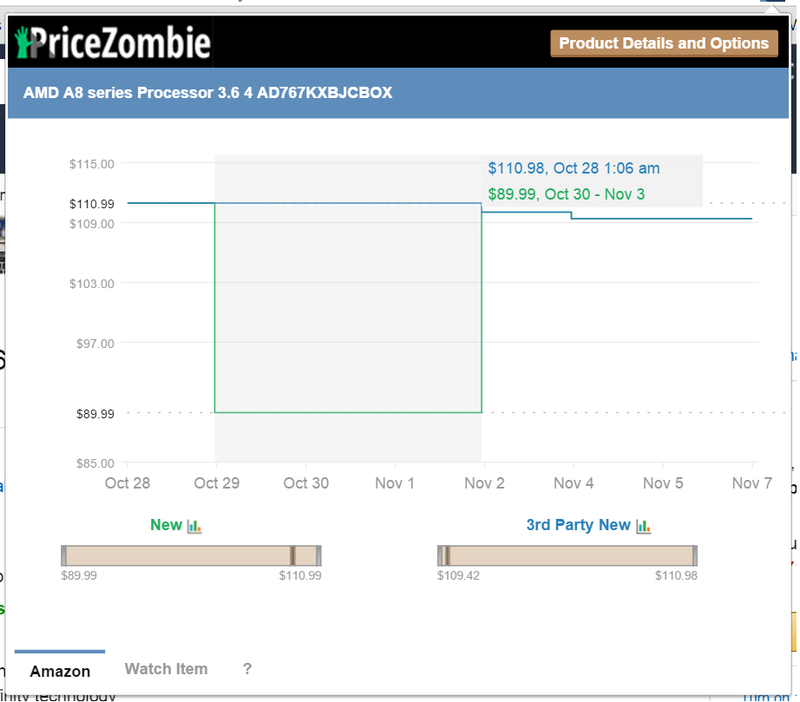 One of AMD's marketing strategies with these ~$100 processors is the price/performance angle. Aside from the integrated graphics, each of the AMD processors can pair with an R7 240 or R7 250 graphics card (DDR3 or GDDR5; AMD suggests an R7 250 GDDR5, as you might expect) in a hybrid dual graphics scenario, boosting performance. Thus, for the same price as an APU and an R7 250 graphics card, on average, AMD aims to offer a better gaming experience — especially for games that run at around 60 frames per second on medium settings — than a similarly priced Intel + NVIDIA platform. We've seen this marketing spiel corroborated in previous reviews, and would expect not to see anything different here. 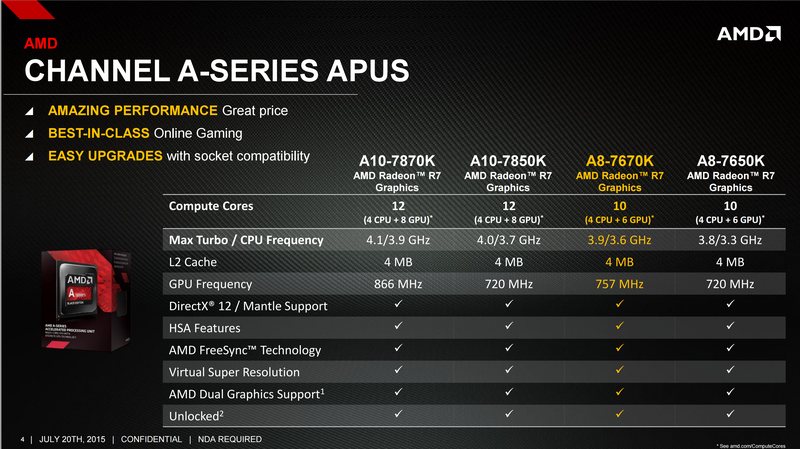 At launch, AMD put a $118 price on the A8-7670K, which, in recent sales, has been pushed down to under $100 at times. The A8-7670K is an FM2+ socket processor, and thus requires either an A88X, A85X, A78 or A68 motherboard to go with it in order to take full advantage. 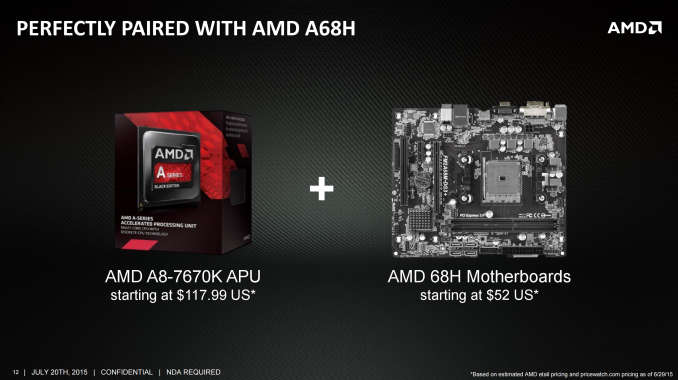 As part of the launch, and given that this processor is a slightly boosted A8-7650K, AMD sees value in pairing it with something like a $50 A68H motherboard, making an APU+MB combination around $150 when on sale. However, as one might imagine, due to the age of the FM2/FM2+ socket, there are relatively few "new" motherboards on the market. The last one we reviewed was MSI's A88X-G45 Gaming, which brought over some of the components seen on its new Intel gaming motherboards, but other manufacturers have also put out M.2 capable AMD chipset-based motherboards as well.